(Nanowerk News) Thermal considerations are rapidly becoming one of the most serious design constraints in microelectronics, especially on submicron scale lengths. A study by researchers from the University of Illinois at Urbana-Champaign has shown that standard thermal models will lead to the wrong answer in a three-dimensional heat-transfer problem if the dimensions of the heating element are on the order of one micron or smaller. "As materials shrink, the rules governing heat transfer change as well," explained David Cahill, a professor of materials science and engineering at Illinois. "Our current understanding of nanoscale thermal transport isn't nuanced enough to quantitatively predict when standard theory won't work. This can impact the design of high-power RF devices that are widely used in the telecommunication industry—for example, 4G wireless infrastructure. The transistor spacing in RF devices is rapidly approaching length-scales where theory based on the diffusion of heat won't be valid, and the engineering models currently used won't accurately predict the operating temperature of the device. The temperature is a key factor for predicting mean-time to failure"
"Our research focuses on understanding the physics of thermal transport on submicron length-scales in the presence of an interface," explained Richard Wilson, lead author of the study published in Nature Communications ("Anisotropic failure of Fourier theory in time-domain thermoreflectance experiments"). "Our study focused on a variety of crystals that have controlled differences in thermal transport properties, such as Si, doped Si, and SiGe alloys," Wilson said. "We coated these crystals with a thin metal film, heated the surface with a laser beam, and then recorded the temperature evolution of the sample. "On length-scales shorter than the phonon mean-free-paths of the crystal, heat is transported ballistically, not diffusively. Interfaces between materials further complicate the heat-transfer problem by adding additional thermal resistance." Researchers found that when the radius of the laser beam used to heat the metal coated crystals was above ten microns, the predictions made by assuming heat is transported diffusively matched the experimental observations. However, when the radius neared one micron, diffusive theory over-predicted the amount of energy carried away from the heated surface. "We discovered fundamental differences in how heat is transported over short versus long distances. Fourier theory, which assumes heat is transported by diffusion, predicts that a cubic crystal like silicon will carry heat equally well in all directions. We demonstrated that on short length-scales heat is not carried equally well in all directions. By measuring the temperature of the sample surface as a function of distance from the center of the heated region, we were able to determine how far heat was traveling parallel to the surface, and deduce that, when heater dimensions are small, significantly less heat is carried parallel to the surface than Fourier theory predicts," Wilson stated. 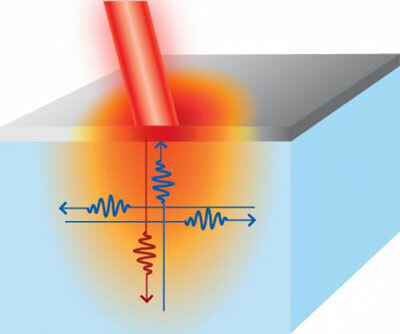 Wilson and Cahill also studied the effect of interfaces on nanoscale thermal transport. "It's been well known for 75 years that the presence of a boundary adds a thermal boundary resistance to the heat-transfer problem, but it's always been assumed that this boundary resistance was localized to the interface and independent of the thermal transport properties of the underlying material," Cahill added. "Our experiments show that these assumptions aren't generally valid. In particularly for crystals with defects, the boundary resistance is distributed and strongly dependent on the defect concentration. " Wilson and Cahill also provided a theoretical description of their results that can be used by device engineers to better manage heat and temperature in nanoscale devices.